High wind speeds create positive and negative pressures. These pressures tear-out windows and doors, break glass from flying debris and force rain into your home. 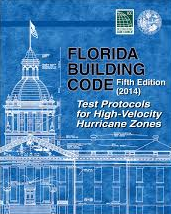 The Florida Building Code (FBC) addresses these issues by defining a set of test parameters for manufacturers to pass. If successful, products are granted a Florida Approval Number. Tests begin with breaking the outboard (impact-resistant) lite, followed by cycle testing to ensure the glass stays in the frame, and the frame stays in the opening. Other tests include water and air resistant and forced entry. In Miami Dade County testing procedures are more rigorous and are underwritten with a Notice of Approval (NOA) number. A Florida Approval Number is then assigned to the NOA. If all openings are not upgraded with impact resistant glass (and not protected with hurricane shutters), the pressures in the table increase as the home is considered ‘partially enclosed’. Use of DP data ensures selecting an approved product for your application, but there are other aspects of the Florida Building Code, such as egress and fire protection of openings to be considered. Be sure to understand these differences to prevent costly mistakes.